There is a scripture in Psalms 68:11 that I want to read based on a dream I had on May 15, 2014, but didn't officially tell about the dream until I preached a message on June 1, 2014 entitled, Keepers of the King's Papers. In this dream, I was at a certain place, and there was someone that had just been made king. I saw that he was walking towards me, so I walked up to him and said, "I am ready to do whatever you bid me to do." He looked at me and said, "You shall ride in my second chariot. And I also want you to be keeper of my papers." Then we embraced one another, and he walked back to his chariot. That was the end of the dream, and I woke up. After looking into the Word of God, I find that there is much written about the king's papers. And that's basically what the two books of Chronicles is about. Also, in the Book of Esther, Chapter 6, King Ahasuerus, of Persia and Media, sent for his papers and had his servant to read them unto him. And what was read to him set in motion the deliverance of the Jewish people. 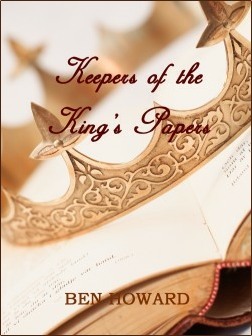 The king's papers were very important in those days; even more so in this day. For us, the King's papers is the King's Word, and the King is Jesus. And now He has made us the living Word in this hour. So when God's servants write about Word, sometimes the writer uses the terminology as though it is a physical letter. For instance, when we read in Revelation, Chapter 10, about the little book that comes down from heaven, it's written as though it's a natural book. But then Christ, the Mighty Angel, says, "Take the little book and eat it." We don't eat paper. But what we do eat is the spiritual revelation of the Word of God. Have you tasted that the Lord is gracious? Yes, because after eating the little book we became the Word; and this is a similarity to the time that Jesus came, and He was the Word made flesh. This is what we have become, the Word made flesh, written epistles. And the eating of this little book has given identity to our flesh and bones that it is soon to be glorified. In the Book of Psalms 68:11, it says, "The Lord gave the word: great was the company of those that published it." I want you to notice that the Lord gave the Word, but someone else published it. The Lord uses His people to publish His Word; so we want to look at some of these keepers of God's Word in this message. I will be very limited in the ones that I mention, and I won't be mentioning them in a chronological order, as that is not our purpose for this message. When I think of those that were used in keeping the King's papers, one that comes to my mind is Luke. He was someone that in most cases did the writing for Paul. It was Luke that wrote the Book of Acts and also one of the four gospels. So upon reading his writings, we conclude that he did a good job in what he was called to do. Notice that the scripture says here, "The Lord gave the Word: great was the company of those that published it." Now the word great here doesn't necessarily mean a great number; although at times there were many people involved in publishing the Word. But even if it's just a few in number, when we publish the Word of God and get the Word out to God's people, then that is great; even though it may be on a small scale. It's been said, "What man calls great, God calls foolish. And what man calls foolish, God calls great." Some of the things that are small in the eyes of man, they are great in the eyes of God. As the song says, "Little is much when God is in it. Labor not for wealth or fame. There's a crown and you can win it, if you go in Jesus' name." So many times what is little is great. A little group can do great things when God is in it. Even in Paul's day he didn't have many people that traveled with him, but they were a great team. Now when we begin to see the Word for our time period, we see that it is the spiritual Word that is built on the foundation that Paul laid. In other words, it's a spiritual revelation that quickens what Paul preached, and that is what the little book is about. The little book is not a real tangible book in the sense of opening a book and turning the pages, but it is the Spirit of God coming down to quicken what's written; such as these promises of,"We which are alive and remain till the coming of the Lord," and "The dead in Christ shall rise first and we shall be changed and caught up to the meet the Lord in the air." (1 Thessalonians 4:16-17) This was set in motion when the seven sealed book (the Book of Redemption) was opened and the Lamb took a little portion of the King's papers called the little book and brought it back to this earth for His wife.